Hi everypony! I'm Aiyanne ~ I'm 27 and work as an illustrator who specialises in digital vector art. I draw in anime and kawaii styles. As a child, I loved watching the 80s My Little Pony cartoon series. 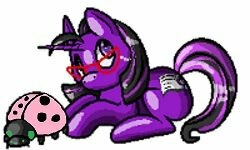 The pony toys I collected and remember fondly were from Generation 2 (each one I played with has long since been donated to charity!). As an adult, I've become a big fan of My Little Pony: Friendship is Magic. I look forward to getting to know this community! Thank you! I am on deviantART, but unfortunately haven't found the time to draw My Little Pony related art yet... It's been on my to-do list for such a long time, but life keeps getting in the way! Hullo and welcome! I definitely second interest in your art, Pony related or not! I do love seeing everyone's art. Welcome to the TP! I'm Alyx from Dallas, TX. Do you have a favorite pony? You too! I love your original pony design! Hello there and welcome! Your art is just lovely, and it's always nice to see another Rarity fan!